Every year for the last few years I’ve done a wrap-up post on the League campaign that’s just ended for us, detailing the players used, who scored what and all that. This is the 2019 version, here are the ones from previous years – 2018, 2017, 2016. A slight statistical oddity this year compared to the previous three years relates, of course, to our participation in the final. This means that the analysis of the eight matches we played in 2019 is set against that for the seven outings in each of the other years so it’s not a like-for-like comparison in the strictest sense. Okay, let’s start with the usual table detailing all the players who were involved, who they played against and what they scored, including what they bagged from play. As in previous years, a tick denotes where a player was in the starting fifteen, an ‘S’ shows where the appearance was as a substitute. It’s a well established fact that we used plenty of players in this year’s League campaign. And we did – 34 in all, of whom 31 started in at least one of the eight games. What might surprise you, though, is that we used 35 players last year (but only 27 started at least once), with 30 deployed in 2017 and a whopping 36 the year prior to that. One of the differences this year, however, is that there was far less continuity in terms of players used. Only two – Aidan O’Shea and Jason Doherty – started all eight matches. Last year, five players were lined out in every match, it was seven in 2017 and four in 2016. Only one other player – Donal Vaughan (who started six games) – played a part in every match this year. Last year two other players took part in every game, with four in this bracket in 2017 and two in 2016. Greater continuity this year came when looking at that group of players who only missed one game. 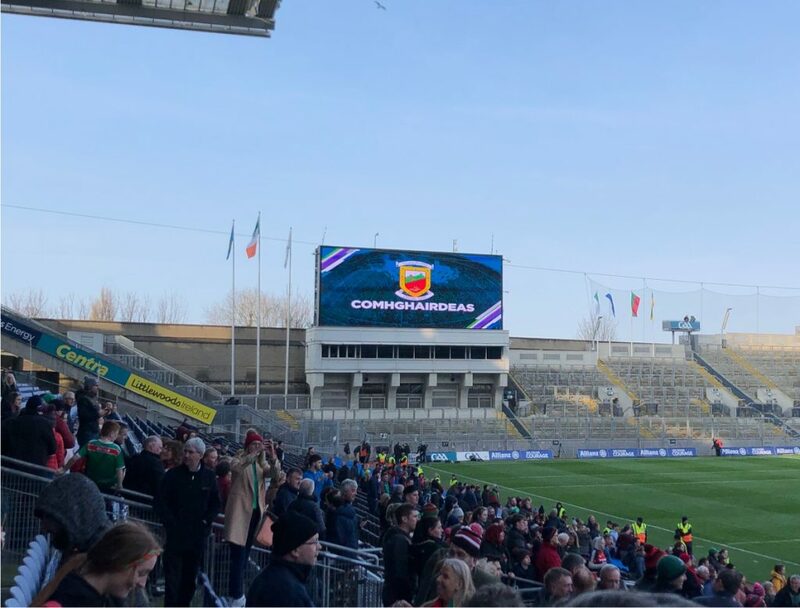 Included here are Keith Higgins (seven starts), Lee Keegan (six) and Andy Moran (three), all of whom sat out the Monaghan match. Neither Matthew Ruane (six starts) nor Kevin McLoughlin (three) featured in the Roscommon game but were both involved in every match after that. Diarmuid O’Connor missed the Dublin game through injury but started in the other seven. Stephen Coen started five times and came on as a sub in two other games, failing to feature only in the final itself. At the other end of the spectrum as regards game time, two players saw their involvement restricted to single appearances off the bench. Seamus O’Shea came on as a sub against Dublin (and went off to the sin-bin on a black card soon after) but injury kept him out thereafter. Jason Gibbons came on as a blood sub in the second half of the Monaghan game. The large amount of experimentation undertaken this spring by James Horan is evidenced both by the number of players who got game time this year but who weren’t involved last year. This changing of the guard is also shown by the number of players who featured for us last year but who didn’t see action at all this spring. In both cases, that number comes to fourteen. Most of the focus this year in that regard has been on the newbies but it’s worth noting that three highly experienced performers – Chris Barrett, Keith Higgins and Donal Vaughan – saw significant action for us in this Division One campaign but didn’t appear at all last spring. Chris and Donie were rehabbing from surgery then while Keith was off playing with the hurlers. Aside from that trio, this year saw James Carr, Darren Coen (recalled to the senior ranks for the first time since 2013), Conor Diskin, James Durcan (who played Championship last year but didn’t feature in the spring), James McCormack, Fionn McDonagh, Colm Moran, Michael Plunkett, Brian Reape, Matthew Ruane and Ciaran Treacy all get a run at some stage. Every one of them started at least one match over the course of the eight-game campaign. 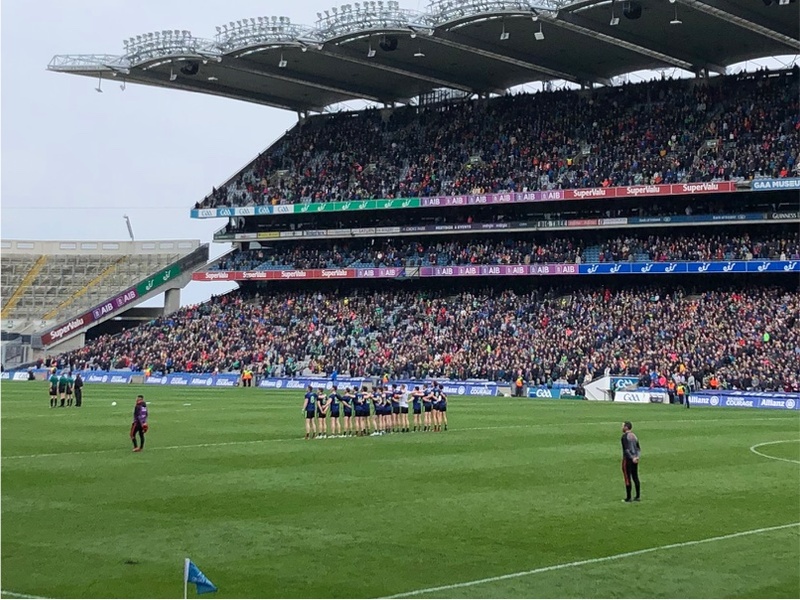 The fourteen who saw action – however fleeting – in 2018 but didn’t get on the pitch in 2019 (although two of them did make the match-day 26 this year) were Shairoze Akram, Caolan Crowe, Neil Douglas, Alan Freeman, Adam Gallagher, Michael Hall, Danny Kirby, Ger McDonagh, Barry Moran, Donal Newcombe, Cillian O’Connor, Conor O’Shea, Tom Parsons and James Stretton. Of these, Caolan and Conor regularly made it onto the match-day 26 but never saw action. Cillian and Tom were, of course, injured while Barry Moran has retired from inter-county action. Our leading scorer this year was Jason Doherty. Entrusted with the place-kicking duties in Cillian’s absence, Doc landed 27 points over the eight matches, twenty of which came from frees. Our leading scorers from play were Kevin McLoughlin (2-5) and Mattie Ruane (2-4). Our title-winning aggregate score this year was 11-89, which was well up on the 3-85 we bagged last year (it was 3-89 in 2017) but with the benefit of the extra game, in which, lest you need reminding, we loaded on 3-11. We conceded a total of 6-90 this year, compared to 7-89 in last year’s seven games and 4-80 the year before that. So, it would seem that defensively we’re a bit better (as 2-10 of that total came in the final) than in recent years but offensively we’re a good bit better, especially in the goal-scoring department. And on that cheery note, I’ll leave you to ruminate on that load of information about our memorable and rather enjoyable League campaign of 2019. Lies, damned lies and statistics – doesn’t apply here! The appearances chart is very interesting and demonstrates how well James Horan has managed the blend between stationing experience alongside rookies. I was a little surprised Brian Reape fell away having started the league so well. Conor Diskin also didn’t get a whole lot of time in the second half of the campaign. Then again the likes of James Carr has coming thundering into the reckoning, and Fergal Boland looks resurgent on the half-forward line. Club championship should be very tasty over the next few weeks given the competition for places in the squad. David Drake – two sub appearances? Great stuff Willie Joe. I count 20 different scorers, including Robbie Hennelly. You’d have to assume that barring further injury, those listed as having played above are going to be pretty much our panel for the Championship,alongside Cillian and hopefully Tom if makes it back. I do wonder as to how many will be in the panel this year – I hope James have plans to include a wider/larger group given the super 8s pretty much require it a 40 man panel. Love that stats table. A ton of info in a few square inches. Great to see the team changes on a game to game basis. It keeps the fans guessing. It keeps the players guessing. It keeps the opposition guessing. 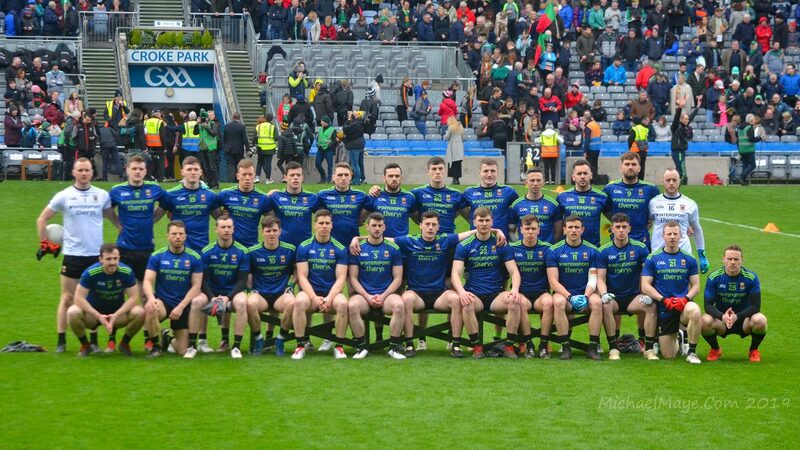 Hopefully the different look Mayo formations will give the opposition headaches all Summer and they won’t have a moulded in stone Mayo team that they can set their focus on. Horan has the squad now sell s few dummies himself as the year progresses. Darren Coen didn’t come on against Dublin. The Galway game was his first appearance of the year. Willie Joe your beginning to slip up a bit:P Only joking. Your a mighty man. Up Mayo. Thanks, Turfmanmayo – I’m usually good for at least one slip-up on that table! It was Stephen Coen who came on against Dublin not Darren. I’ll correct the table tomorrow and the text as well if needs be. Two interesting stats from.that incredibly detailed table..(how do you find the time W J??!). 3.18 scored by players who played U 21 in 2016. (.I am.open to correction on that one)..And 27 points from Jason D!! I hadnt realised his tally was so high..
Kerry scored the second goal they all stood up in unison and let a mighty roar that shook the stadium. And for the first time I thought ……… there ye are! some of the tackles we were making ! Excellent work by you WJ. Not just on the stats page but from the initial podcast back in early January. You are a mighty Mayo man. Delighted for all the newbies, as well as the not so new. There are a couple of gems to emerge into the mix over the next few seasons IMO. Onwards and Upwards we go. I believe its 4-20 from the 2016 U21 squad, Regina. Reape was on that team but didn’t play in the final due to injury. Great to see Boland and DOC mature into the fine players they now are……From County perspective I hadn’t rated either 2 years ago. Now really key men. I’ve now made than change to the table and added a sentence to the text on Stephen Coen’s involvement in the campaign, as he featured in seven of the matches. Also, for info, the new podcast episode will now be online later on tonight. I’m out doing stuff this evening so will post it to the blog once I get back home, a bit after ten or so. 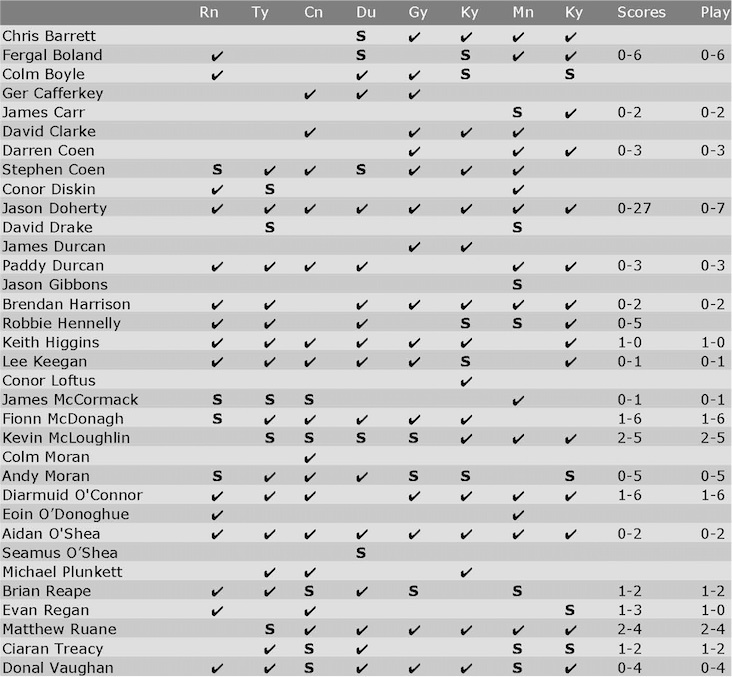 It’s hard to pick a starting 15 at the moment with the competition in the panel.This weekends club championship will be very interesting.Darren Coen and Fergal Boland put up some very high scores in club league games last weekend. Excellent work Willie Joe. Always worth examining these data in detail, as the internet induced group think often leaves us with a poorly grounded consensus on how things did or did not go for Mayo. That Jason Doc was top scorer is no surprise given his free taking role, but that Kevin Mc and Mathew Ruane were next in line is both interesting and significant. In Kevin Mc’s case, the old dog for the hard road, I think it shows the standard of consistency and overall contribution that newer forwards on the panel have to aim for. In the case of Ruane, it’s a tremendously promising signal from such a young midfielder to contribute that score. I definitely felt Horan was braver this year in giving different players a decent chance, although it is not as obvious a conclusion when you look at previous year’s numbers. I don’t know if it is possible Willie Joe (it’s probably a whole other level of effort) but would it be possible to see number of minutes played by player? Thanks, Mick – that should be possible to do, with access to match reports that provide the time when the substitution was made, but I’m afraid that’s not a level of analysis I plan to get to on this occasion. I’d say Aidan played every minute until he was put off in the 70th minute of the final and, as Jason Doc was subbed at least once, that would make Aidan the player with most minutes on the pitch during the campaign. Thanks Jimbo, will check that out.